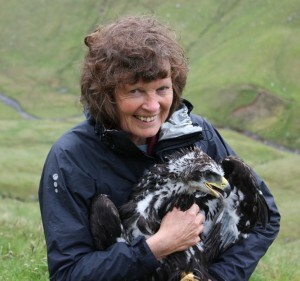 Wendy Mattingley is a member and former Chair of Tayside Raptor Study Group, one of the twelve SRSG branches. Wendy’s interest in birds began with her father teaching her bird songs at an early age but it was not until she was married and lived in Fife that a number of stalwart members of the SOC really influenced her birdwatching activities. Once she moved back home to Aberfeldy, an interest in raptors grew thanks to the wealth of experience handed on from Sandy Payne, Graham Rebecca and Brian Etheridge. Wendy completed a few field seasons with the RSPB monitoring a number of raptor species mainly in north Perthshire. In the late 1990s Wendy became the Chair of Tayside Raptor Study Group and held the position until 2013. The main species Wendy monitors in Highland Perthshire are Hen Harrier, Merlin, Raven, Golden Eagle and Peregrine. Over the years Wendy has become more inclined towards Hen Harriers and Raven as for her there is nothing more evocative of the Scottish uplands than hearing a croaking Raven or watching a male Hen Harrier sky-dancing. A longed for hope is the eradication of illegal persecution so that the latter spectacle remains for future generations of raptor workers. Wendy’s other passion is Cluny, the Himalayan woodland garden she runs with her husband as a tourist attraction and home to a good selection of woodland birds and Red Squirrels.